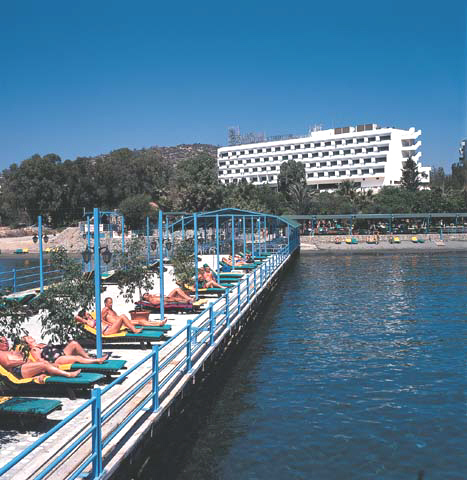 Elias Beach Hotel and Country Club is a four star hotel offering a five star service. Superbly situated on a sandy beach in the Ancient Amathus district in Limassol. Entering the main lobby area you immediately feel the warm and familiar atmosphere of the hotel. The buildings interior and exterior are enveloped with magnificent trees and greenery and the extensive tropical gardens lead down to the hotel's own pier. This classical restaurant is the hotel's main dining room. The cuisine is international with the opportunity to taste local Mediterranean dishes. The Pavilion Coffee Shop - Daytime meals including our buffet breakfast, A La Carte lunch, snacks and beverages are served in this more casual, garden-like setting. Pavilion Pergolas Restaurant (summer season) During the summer time dining always takes place outside at our open air restaurant surrounded by our exotic gardens. Apovathra Fish Tavern (summer season) A unique tavern, the only one on the island serving fish directly on the sea. It is a must to try the Cypriot fish meze and enjoy the romantic setting. Galaxy Bar The hotel's main Bar situated in the lobby area is a cosy place for afternoon tea, an aperitif or after dinner drink, accompanied most evenings by live piano music. Why not make the most of our Happy Hour when two drinks are served at the price of one! Pool & Beach Bars (summer season) Both serve a variety of beverages and ice cream with the option to have light snacks at the bar for guests not wishing to venture too far from the pool or beach area. 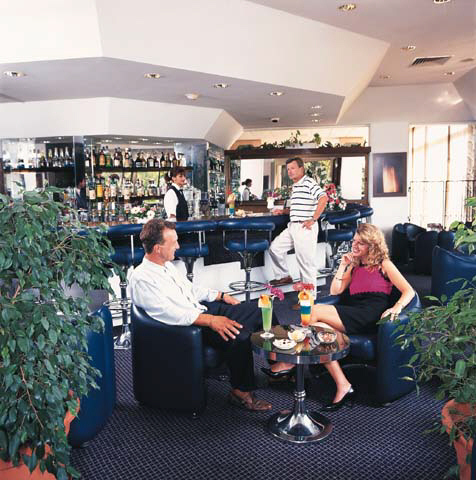 The hotel offers live entertainment most evenings with its resident band, which plays international and local music. 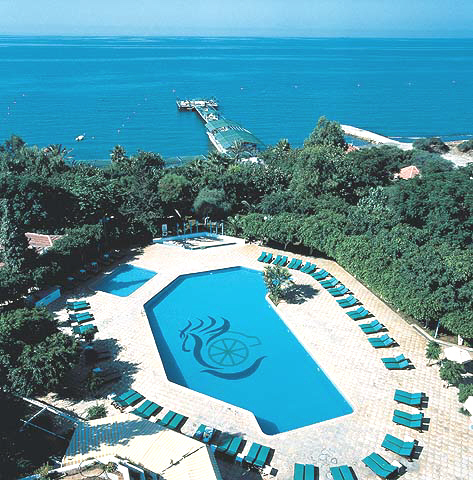 Guests can experience a special Cyprus night with a live folkloric Cypriot show and a traditional rich buffet. Most other nights are also based on theme buffets with the BBQ Night by the seaside and our Italian Night with authentic dishes accompanied by a variety of appetizing salads. Aerobic classes and table tennis competitions are also programmed throughout the week for guests that want a more active holiday. The Elias mini club, opens during July and August, is ideal for families with young children. Parents can enjoy the mornings in peace while our qualified supervisor entertains our little guests with table games, quizzes, drawing classes and fun in the play area. 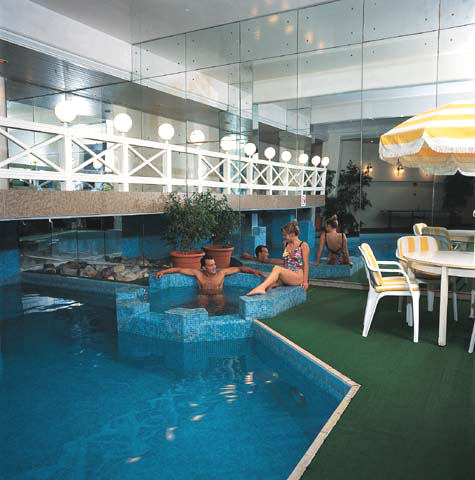 The Health Club is equipped with a gym, sauna, Jacuzzi, steam baths, massage room and a small heated indoor pool. The tennis and squash court, table tennis, pool tables and electronic games are also available for amusement. Free Shuttle service to Country Club. Free Greens use for 18-hole Golf course (equipment hire optional). The hotel's 175 spacious rooms, most with a view to the Mediterranean sea, offer comfort and all the required facilities for a pleasant stay. 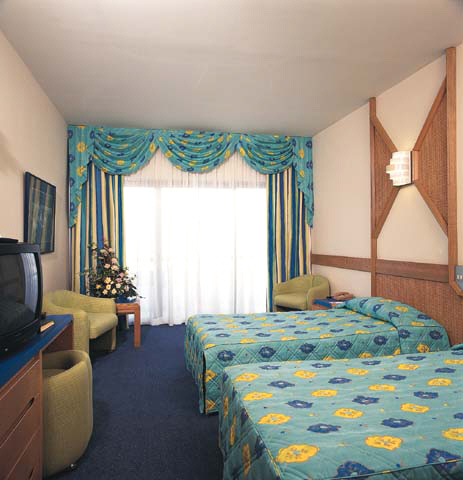 They have air-conditioning / central heating, balcony, colour T.V. with some pay T.V. channels, hair dryer, radio, mini bar, direct dialing telephone, bathroom and full length mirror. 52 of these rooms are sea view Junior Suites which are ideal for families with young children or for a couples special treat. Few shops, bars, restaurants, supermarket and bank in the area. 4 km to main Germasogeia tourist area. Prices in Cyprus Pounds, Per Person, Per Night on Bed & Breakfast Basis. One Child up to 12 years old. 1st Child FREE when sharing a room with 2 adults on bed and breakfast basis. 2nd Child FREE (only possible in Kids Suites Sea View) when sharing a room with 2 adults and 1 child. 30% Discount when sharing a room with 2 adults on bed and breakfast basis.